An international team of astronomers has discovered a new magnificent example of a planetary nebula showing fast moving jets. The planetary nebula — supposedly the final swan song of a Sun-like star — is shown to be hosting not one but a couple of stars, whirling around each other in half a day. This provides another clear evidence that links bipolar planetary nebulae with the dramatic history of the marriage between two stars. 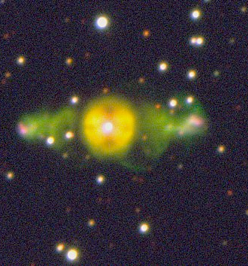 The planetary nebula, named ETHOS 1, is the first confirmed planetary nebula from the Extremely Turquoise Halo Object Survey (ETHOS) that seeks to discover planetary nebulae at high galactic latitudes, i.e. far from the main plane of the Galaxy. ETHOS is a new survey designed to find high-latitude compact PNe that would ordinarily be missed by visual searches of all sky photographic atlases. The discovery images from the SuperCOSMOS Science Archive already hinted at the very peculiar nature of this nebula, with clear polar outflows (jets) coming out in both directions. Deep images obtained with ESO’s Very Large Telescope (VLT) have confirmed the intricate nature of the object, with very stringent jet tips, an inner nebula, as well as a pinched waist, conspiring to produce an X-shaped appearance. Further observations with the VLT and other telescopes allowed the astronomers to build a kinematical model of the nebula. They have shown that the jets are found to be travelling at about 120 km/s (430 000 km/h). The jets are also found to be twice as old as the inner nebula, suggesting of a limited period of jet activity occurred before the planetary nebula was actually produced. This would confirm the binary hypothesis for the formation of this planetary nebula. This hypothesis stipulates that the nebula is the final outcome of what astronomers call a common envelope phase, during which one star looses its outer envelope to its companion in an act of cosmic cannibalism. The transfer, however, becomes unstable and soon the two stars spiral in inside the envelope. Finally, the envelope is ejected as a planetary nebula and the two stars are now orbiting around each other in a frenetic cosmic waltz. Observations made with the Flemish Mercator telescope on La Palma, Spain, have confirmed the presence of this waltzing couple. The astronomers found that the star which lost its envelope — and soon to become an object known as white dwarf — is so hot and so close to its companion that it its irradiating it. The two stars circle around each other in a little over half a day (0.535 days or 12.84 hours). 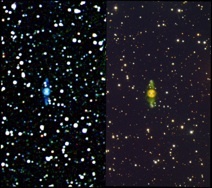 The newly found ETHOS 1 stands thus out as one of the few planetary nebulae to have both polar outflows (jets) and a close binary central star. 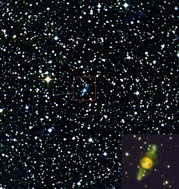 (Above left) Discovery image of ETHOS 1. (Lower left) Montage of VLT ETHOS 1 images. (Right) VLT narrow-band image of ETHOS 1. The paper, published in Monthly Notices of the Royal Astronomical Society, is also available on astro-ph (ETHOS 1: A high latitude planetary nebula with jets forged by a post common envelope binary central star, by B. Miszalski et al.). The team includes Brent Miszalski (University of Hertfordshire, UK), Romano L. M. Corradi (Instituto de Astrofísica de Canarias, Tenerife, Spain), Henri M. J. Boffin (ESO, Chile), David Jones (Jodrell Bank Centre for Astrophysics, UK), Laurence Sabin (Universidad Nacional Autónoma de Mexico), Miguel Santander-García, Pablo Rodríguez-Gil and Maria del Mar Rubio-Díez (Isaac Newton Group of Telescopes, Santa Cruz de la Palma, Spain). This page was created by Henri Boffin on 15 December 2010.